In a quick win, one of its first ticket holders even scooped £2,000 as a Christmas bonus! With 12 teams involving 125 young players from six to 16, the club is now one of 77 good causes registered with LotterySK - steaming into 2019 with £71,000 heading for community good causes in its first year. For lottery organisers South Kesteven District Council, every new community group signing up is cause for celebration, says council Deputy Leader Cllr Kelham Cooke. "We are very keen to promote sports and leisure across the district and it's great to see a club that's doing such good work with youngsters set to benefit from our community lottery," he said. "If club supporters throw as much energy into pushing ticket sales as those youngsters put into their football they will do very well, and we will do all we can to help them get the funds rolling in." 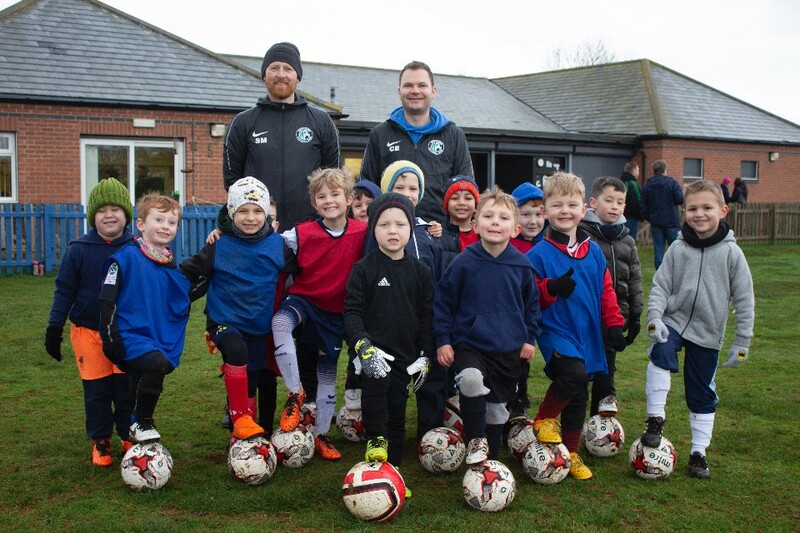 With practice sessions on a Saturday morning and matches on a Sunday, Barrowby's Westry Corner playing fields become a hive of activity, leaving club organisers continually looking for extra ways to raise funds. "Our aim is to help youngsters play football without too much expense, so we are always looking for ways to keep subscriptions down," says club chairman Steve Hynard. "For ticket holders to be able to choose their favourite cause with LotterySK is a massive appeal. We have a lot of parents and we will be giving ticket sales a big push in 2019." Players have a one in fifty chance of winning one of the prizes which range from three extra tickets to the £25,000 jackpot. When a participant chooses one of the good causes, the organisation receives a 50 pence donation, and 10 pence goes to a central 'Community Fund'. If no charity is chosen, all 60 pence goes to the community fund. Caption:Barrowby under-sixes, with Steve Moore, team manager, and Matt Hully, team coach.